Please let them know you appreciate their support! We'll be adding our NPE stories one-at-a-time throughout the month of March. Just scroll down to see the current coverage. Thanks to Allan Heydorn and all the NPE staff for their capable assistance. Although extensive, our coverage of this event is just the tip of the iceberg when compared to the overall information provided to show attendees. Click here to go to the NPE website and make your plans now for attending NPE next year! Now Online: This year's presentation of WorldSweeper.com's annual Award of Excellence in Power Sweeping . Our editor, Ranger Kidwell-Ross, presents WorldSweeper.com's annual Award of Excellence in Power Sweeping at the NPE's Sweepers' Roundtable. Now Online: An interview with Allan Heydorn, PAVEMENT magazine editor and NPE coordinator. Allan Heydorn discusses with Ranger Kidwell-Ross, editor of WorldSweeper.com, his take on the state of the sweeping and pavement maintenance industries. Guy's article, called 'Don't be Chicken Little,' is designed to help sweeping contractors think about the way they are making decisions today, as compared to when the economy was humming along. 1. Understanding how fear influences decision making. 2. How not to allow complacency to creep in. 3. The Parkinson Principal and how to fight it. Now Online: An article by James Lea, professor at the University of North Carolina at Chapel Hill and a nationally known family business speaker, author, and advisor. James' article, called 'Business Sage has Answers to Tough Family Business Queries,' is self-explanatory. If you run a family business, don't miss it! Don Turner, who presented a seminar by the same title at NPE 2009, has a conversation with Ranger Kidwell-Ross, editor of WorldSweeper.com, about what the most cost-effective marketing is in today's downturn economy. You won't want to miss all the terrific ideas these two -- both of whom have been pavement industry marketing coaches and consultants for over two decades -- come up with as inexpensive ways to keep your company competitive in your market area. Discussion focuses on how contractors should be tailoring their marketing efforts in 2009, when money is tight and competition is cutthroat. The foundation of this article is a 50+-minute audio exchange absolutely packed with good marketing ideas. Our editor, Ranger Kidwell-Ross, presented an NPE seminar on saving money on fuel and related expenses. Learn how your sweeping company can lower its fleet operating costs, as well as in many other areas. We have 18 vendor videos -- and an audio -- that we'll post throughout March. Be sure to check back on the introduction date! Note: If you hear the interview at 'chipmunk speed,' you will need to download the latest version of Adobe's free Flash player. Stearns Bank is a bank-affiliated financing company specializing in sweepers and other pavement industry equipment. Interview is with Jim Peach, account manager for Stearns Equipment Financing Division. Ed Brown, president of Topper Industrial, new owner of Whart Hog Brooms, talks about his plans for the Whart Hog Broom line. Reach Whart Hog Brooms Toll Free: 800.529.0909, or by going to www.wharthogbrooms.com. 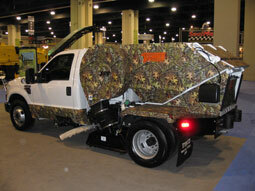 SK Sweepers Offers Single-Engine Sweeper. Bob Hammond, managing partner for SK Sweepers, provides info on his company's single-engine sweeper model. Chris Vanderhof is general manager for Q-Equips, which is the used sweeper portion of Joe Johnson Equipment. Q-Equips currently has a fleet of (mostly) 2003 Elgin Eagles that were municipal-owned, dealer-maintained, and that have a host of extra features. Reach Q-Equips Toll Free: 866.737.8470, or by going to www.q-equips.com. Frank Chulick, president of Stewart-Amos Sweepers, shows viewers around his company's Starfire-6 mechanical broom sweeper. Reach Stewart-Amos Sweepers Toll Free: 800.482.2302, or by going to www.stewart-amos.com. Sarah Gazi is now the Executive Director for NAPSA; Kristy Byer is Membership Coordinator. Along with a new logo and a new website that will be unveiled in May, Sarah discusses the coming direction of the organization. Reach NAPSA by calling: 856.380.6845, or by going to www.napsaonline.com. Brian Peters is a sales associate with MB Broom. In this interview, he discusses the company's walk-behind broom. Reach MB Broom Toll Free: 800.558.5800, or by going to www.m-bco.com. Perry Stenzel introduces United Rotary Brush's TurbolineTM gutter brooms, first in the company's line of SmartSweep recyclable road brooms. The unique system allows tuft changeout on the broom plate to save on replacement cost, storage costs and shipping, as well as provides an entirely new look. The design has been used successfully in Europe for a number of years, for use from parking lots to milling cleanup and street sweeping. Brad Staley, sales associate for Victory Sweepers, Inc., conducts a walkaround of Victory's new Liberty design, which is also available as a non-OEM replacement kit to fit 2000 and newer Schwarze 347 and 348 sweeper models. Reach Victory Sweepers' Toll Free: 866.507.9337, or by going to www.victorysweepers.com. Tom Rokas, long time TYMCO sales associate, discusses his company's product line and how it fits in with today's emerging green marketplace -- in even more ways than how the camouflage sweeper they had at the show would do so with a background of trees... Use the audio link, below, to hear this 10-minute update on TYMCO. Unfortunatly, we had technical difficulties with TYMCO's NPE video, so have substituted an interesting, informative audio interview with Tom. Reach TYMCO Toll Free at 800.258.9626, or by going to www.tymco.com. Tom Rokas' Email Address is tomrokas@tymco.com. Ryan Cron explains his company's full-featured fleet management software. Caleb Boyd, account executive with Center Capital, is interviewed as an attendee at NPE. Reach Center Capital Toll Free: 800.344.2224, or by going to centercapitalcorp.com. Troy Schuller shows off the newly redesigned Centurion sweeper now being made by Wayne. (Formerly the Tennant Centurion.) Shuller talks about the many modifications Wayne has made to the previous design. Frank Ligori explains what Federal Signal's Wearmax line of drag shoes has to offer. Gregg Blair talks about Superior's non-marking drag shoe line and vacuum tube inserts for sweepers. Eddie Cagle, sales associate for Victory Sweepers, Inc., conducts a walkaround of Victory's Mark I model, single-engine parking area sweeper. Brian Giles, sweeper products manager for Elgin, provides a tour of the new Megawind combination heavy duty sweeper and catch basin cleaner. Reach Victory Sweepers' Toll Free: 800.323.4962, or by going to www.elginsweeper.com. Did you like what we did this year? If you have suggestions for next year, please let us know.